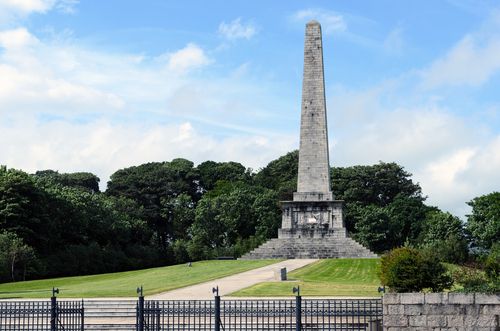 The Ross Monument is found on the A2 between Warrenpoint and Rostrevor. There is a lay-by opposite with a terrific view down the lough. This commanding position was chosen as the place to honour Major General Robert Ross who fought both in Europe and the America's Second War of Independence. His monument, erected in 1826, celebrates his victory over the American forces in Bladensburg in 1814 and his entry into the capital, Washington. He is reputed to have burnt down all the public buildings including the presidential mansion, and to have eaten the president's breakfast, he having left in a hurry.